The Yoga 3 Pro seems to run fairly well, but when I ran the test at userbenchmark.com the comment was "17.6% is an extremely low CPU score. It's a wonder that this system was able to run the User benchmark software." I ran the Lenovo Optimizer and it, too, said the processor was running too slow. It offered 2 suggestions to speed it up, but after trying to implement the suggestions a number of times and getting an error message that said it couldn't fix the problem andI should try again on another day, I gave up. The two suggested fixes didn't seem to have anything to do with processor speed, only updating some software. Anyone have a similar problem or know what is going on? Use high performance plan and then rerun your benchmarks. 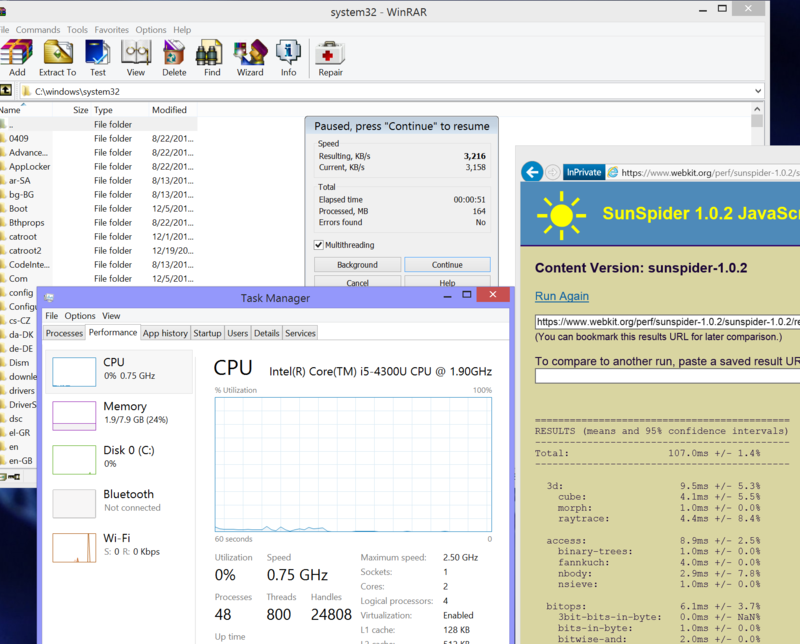 Also try Winrar Benchmark and see if CPU usage goes to max CPU and Turbo frequency. With the Intel 4300U on my Tablet, I get 3216 KB/s. You should be able to get at least 2500 KB/s if it's running at full speed. I have this same issue. Just about everything runs with a lag. I've even gone through and shut off some of the non-essential software and services to see if I get a boost. What is crazy that on this computer with just a few chrome browser windows open the processor will run around 20%. It is running at a really low ghz. It is like this even when in high performance. Unfortunately, as we have all discovered, this laptop is NOT fast. Put it in high-performance, and it will still run slower than last year's averge latop selling for less than $1000. omg. this is so depressing as I blindly keep on hoping that some update gets released and fixes this laptop being too slow. I have had this laptop for only 2 months and there would be times that I feel like I wanna toss it out the window out of frustration. I invested on this thing supposedly as my reliable work horse... then this. Unfortunately the 'fix' is to use a Core i5 rather than the Core M, which seems more like an i3 level component. If you can, return your Y3 and buy a Y2. I don't think I can still return this to the store after having it for a little bit over months? Though it's 100% scratch free and still looks and even smells brand new. so.. thinking of just selling this baby and buying a yoga 2 pro.